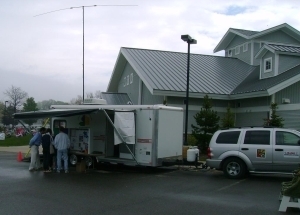 This is the CCECPSCO emergency communications trailer at the Moving Wall exhibit in Petoskey on June 1, 2008. Operating inside the trailer is Chuck Scott N8DNX. Standing to the right is Jack Messer, the Charlevoix, Cheboygan, Emmet County Emergency Manager at that time. 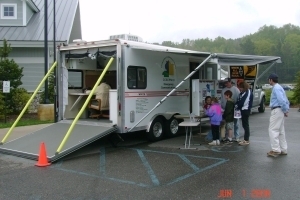 Jack setup the CCE emergency services display next to our trailer for this event. He's shown here watching as a family is exploring the NOAA Weather alert radio. In this view a temporary mast with a "BuddiPole" antenna used to demonstrate Ham Radio is visible. The HF bands weren't all that good that day, so communications on HF was limited. The location is the Emmet County Fairgrounds. The CCECPSCO Communications Trailer during Field Day 2009 in Mackinaw City. The racks and antennas were installed by the time of this picture. Additional antennas have been added since. 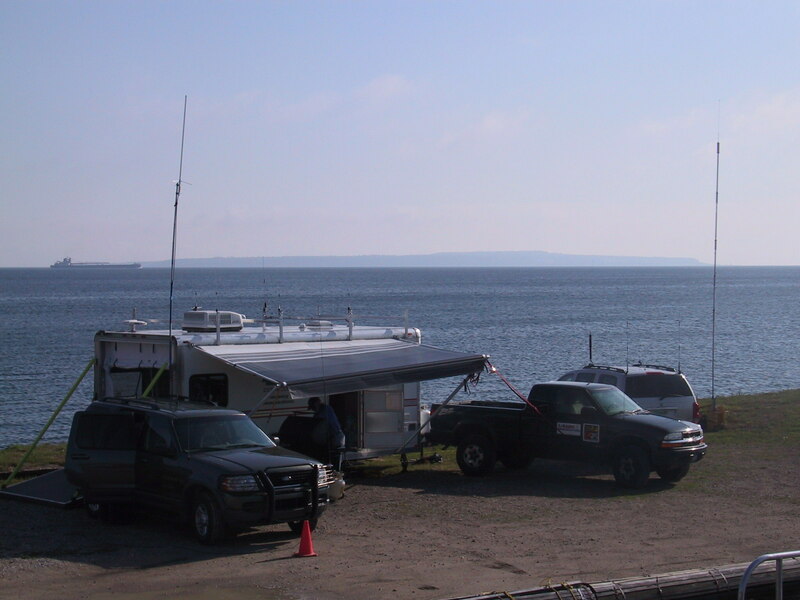 The HF vertical at the right is one of the HF antennas that stores in the trailer when not in use. 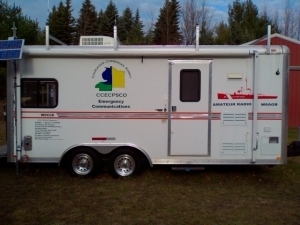 A side view of the trailer. A list of major contributors is at the lower left. The solar panel is used to float-charge the 24V battery chain (250 AH at 24V) when the trailer is deployed. Obviously it's not enough to run the 2.5 KW inverter, but it will bring the batteries back up enough over time if we don't need the inverter running continuously. Normally the inverter is plugged into shore-power when the trailer is in storage, so that chain is always ready to go when the trailer is needed. Those four 125 AH batteries can power much of the AC needs in the trailer for 4 to 8 hours and even for an hour or so with the air conditioner running--certainly long enough to do periodic servicing of the 10 KW portable generator carried with the trailer. There are also two 12V 125AH batteries (250 AH at 12V) that are the primary 12V power source for most of the radios in the trailer. Those batteries are charged by the 50A house charger when the trailer is powered by the generator, shore-power, or the power inverter.